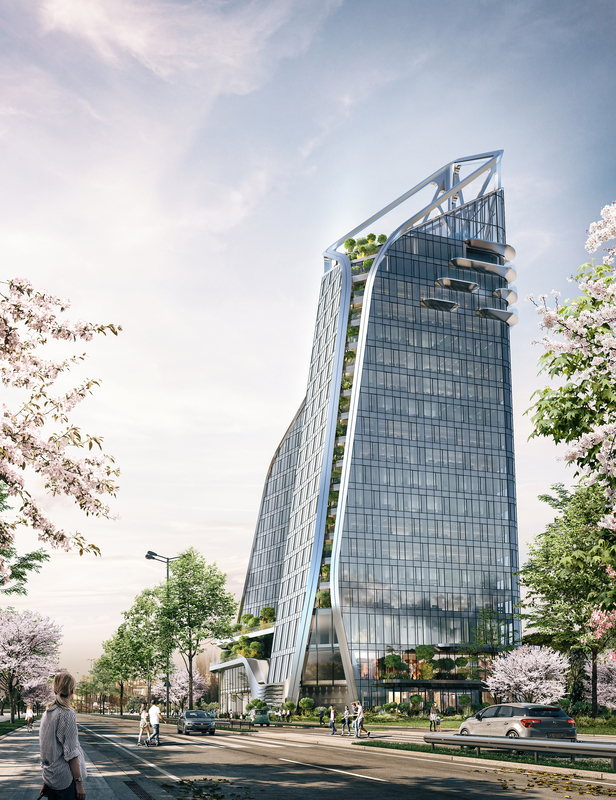 NV Tower is a large and innovative project for a multifunctional building located in an attractive area in the south-east of the city of Sofia. The location is one of the most suitable for developing such large-scale multifunctional projects in the city, with well-developed public transport and convenient car access. 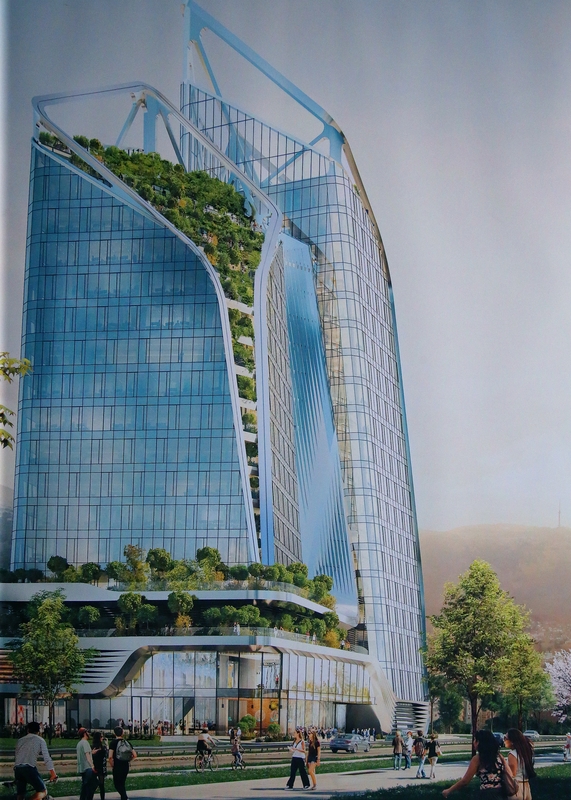 The building offers first class office spaces, luxury homes and a wide range of public amenities: eating establishments, retail outlets, wellness and sports center, roof gardens and landscaped terraces. The complex functional organization is mastered in a common structure, providing maximum flexibility in the construction and use of each individual object in it. The project follows the most up-to-date urban and architectural trends: multifunctionality, extensive public spaces in different areas of the building, richly landscaped roofs and facades, carefully constructed architectural silhouette, taking into account the context of the environment,opening the building at the level of ground to the city. Recognizing the responsible role in designing and building a project of this magnitude,the multi-layered architectural image of the buildingis based on the careful exploration of the potential of the territory and the natural features of the surroundings. Part of the inspiration is sought in the structure of natural crystals and the dynamics of mountain peaks. 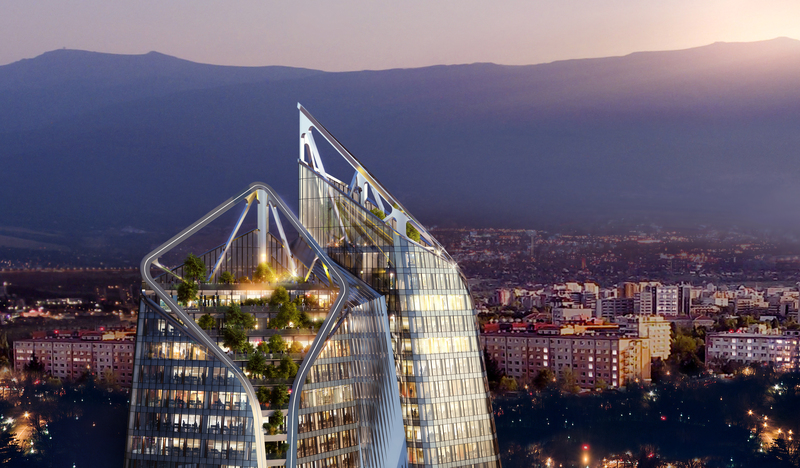 NV Tower has the important task of enriching the silhouette of the city of Sofia and will undoubtedly be one of the significant projects marking the development of the capital city in the first half of the 21st century. 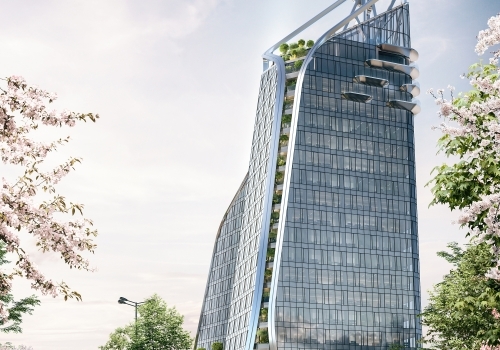 NV Tower is situated in the south-eastern part ofthe city of Sofia, on G. M. Dimitrov Boulevard near to the crossroad with DraganTsankov Boulevard, in an area that is attractive for investment and is becoming one of the main business areas of the capital city. Both boulevards: G. M. Dimitrov Blvd.and DraganTsankov Blvd.are main city road arteries. G. M. Dimitrov Blvd. is part of the ring road connecting the southern and eastern districts of the city of Sofia with the radial boulevards and continuing to the Northern Speed Tangent. Nearby is the most intense junction in the city–the junction onTsarigradsko Shose Boulevard – 4 km. DraganTsankov Blvd.is an important radial boulevard connecting the center with the south-eastern quarters and continuing to the southern arc of the Ring Road to the villages at the foot of Vitosha Mountain. The area is easily accessible by car from anywhere in the city via both boulevards, but also has excellent access to the city transport system. 300 meters away from the NV Tower is ‘G. M. Dimitrov’ Metro Station from metro diameter 1 of the underground railway of the city of Sofia.The Metro Station is one of the most intensively used because of the multifunctional nature of the territory–residential neighbourhoods, educational institutions and student campuses, office and administrative buildings. There are also bus stops of several bus lines in the immediate vicinity.It is planned to build a new tram line parallel to G. M. Dimitrov Blvd. Apart from the center of Sofia, via the Sofia Metro and the boulevards, the area of the project is conveniently connected with Sofia Airport, Central Railway Station, four of the six malls of the city and othermajor business areas of the city: Business Park Sofia, Tsarigradsko Shose Blvd. and Bulgaria Blvd. The area is attractive for investment andin recent years there has been considerable interest in building business and housing buildings. Each new project strengthens its attractive power as a preferred place to work and live. The Student’s Town is the region with the fastest growing population in the city and the nearby districts of ‘Iztok’ and ‘Izgrev’maintain some of the highest real estate prices in the city of Sofia. There are several parks nearby: Loven Park and Borisova Gradina, Studentski Park, Sofia Tech Park.